Driving along the shore of the Dead Sea on our way to Masada and Ein Gedi, I usually point out the cutoff to Nahal Dragot – there are some great hikes here if you are up to the challenge. In fact, Nahal Darga as it is also called, is a kind of test for Israelis. From the center at Metzukei Dragot, there is an unpaved road (if you were to continue north you could go as far as Herodium), take the turn to a lookout point with a great view of the canyon, the deepest part of Nahal Darga and a hint of what awaits. Returning to the main road and continuing westward we come to the start of the black trail. From there it is a short hike to the Murabat Caves, 3 caves, side by side on the northern cliff. It was here that letters signed Bar Kosiba were found, evidence that the mythical leader of the Bar Kochba Revolt against the Romans in 132-135CE did in fact exist. Peace! My order is that whatever Elisha tells you, do to him and help him and those with him. Be well. From here it’s about a 150 m. descent to the start of the canyon. It will take 4-6 hours (4 km) to hike this part of the narrow canyon with more than 50 meter high walls, dry waterfalls and pools of water in natural craters (note there are places you will have to swim across). At the end of the hike the wadi widens and crosses highway <90> about 1½ km from the Mezuke Dragot cutoff, estimate that to complete the hike will take a full day. There are metal D-shaped rings hammered into the rock in places to help you on the descents but it’s probably also worth having at least 20m. of rope. A guide is recommended. Amitai in Nahal Darga, photos AdirChai Haberman-Browns, used with permission. 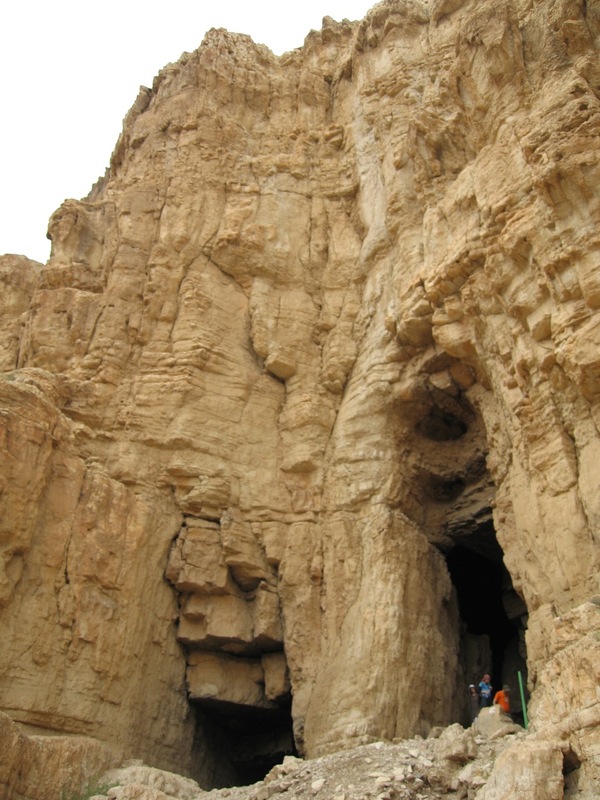 This entry was posted in Hiking, Nature, Water and tagged challenging hike, Dead Sea, desert hike, hike, hike with water, Hiking, Judean desert, nahal darga, swimming on August 11, 2010 by Shmuel Browns.